Kanazawa literally means stream of gold. In old days in Kanazawa, there was a man called “Imohori Tougoro”. He found golf fust when he cleaned sweet potato. This is why we call the city “Kanazawa”. We don’t have gold mines, still 99% of gold leaf used in Japan is made in Kanazawa. Kinkakuji in Kyoto, known as golden pavilion, its wall’s gold is from Kanazawa. In Kanazawa, you can buy lots of golden crafts. Not only buying, you can even make your own crafts – e.g. chopsticks or jewelry box with gold leaf. When it comes to gold, you will think something expensive. However, handmade gold leaf is an affordable price. 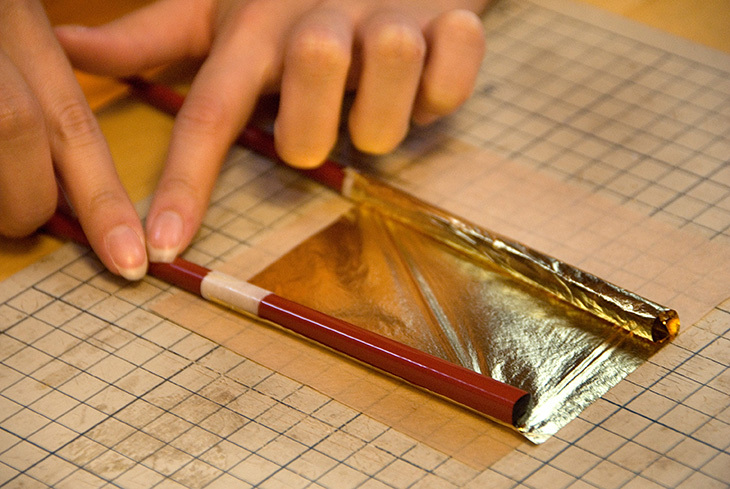 You never be able to experience making your crafts with gold leaf in any other place on the planet out of Kanazawa. There are several places offering handmade experience. I definitely recommend here because not only craft experience, you can see the process of making gold leaf in Sakuda. And also Sakuda is close to Higashi chaya geisha district. They are close to Higashi chaya geisha district. From Kanazawa station, it takes 20 minutes by walking. By bus Kanazawa loop bus (clockwise) is convenient. Hours 4 times a day. 1 hour each time. 50 people at a time. Fees (e.g.) 600yen for chopsticks. 900yen for a lacquered plate. 1, 400yen for a compact mirror. They are also located Higashi chaya geisha district. They are close in Higashi chaya geisha district. Walking 1 minute and then you will come into Higashi chaya geisha district. Hakuza is on the left side. Hours 6 times a day. 1 hour each time. Fees (e.g.) 540yen for postcard. 1, 000yen for a chopsticks. 1, 500yen for 4 pairs of small plates.